The opening verse of Chapter 50 attributes this Psalm to a man named Asaf. Although no identification is provided here, from elsewhere in Tanakh it emerges that Asaf was a Levite who, together with David, composed songs of praise to be sung by the Levi'im in the Bet Ha'mikdash (see Divrei Hayamim II 29:30). In this chapter God is described as "calling to the earth" (verse 1) to cast judgment upon His people, Am Yisrael. In His declaration, the Almighty touches upon one of the fundamental themes discussed by the prophets, namely, the mistaken belief in the intrinsic spiritual value of sacrifices. God proclaims that as He already owns the entire earth – including the animals – and in any event has no need for meat, He does not ask Am Yisrael to offer more sacrifices. What He does ask, as He declares in verse 14, is that we "sacrifice to God a Toda," which the commentaries interpret as a reference to Viduy, sincere confession of sin. The act of sacrifice is secondary to the internal process of repentance; the Almighty seeks primarily not more animals on the altar, but rather more contrition upon our hearts, and a greater commitment to grow and improve. God thus condemns those who feel they can magically erase their transgressions through the offering of sacrifices without feeling genuine remorse and committing themselves to change. 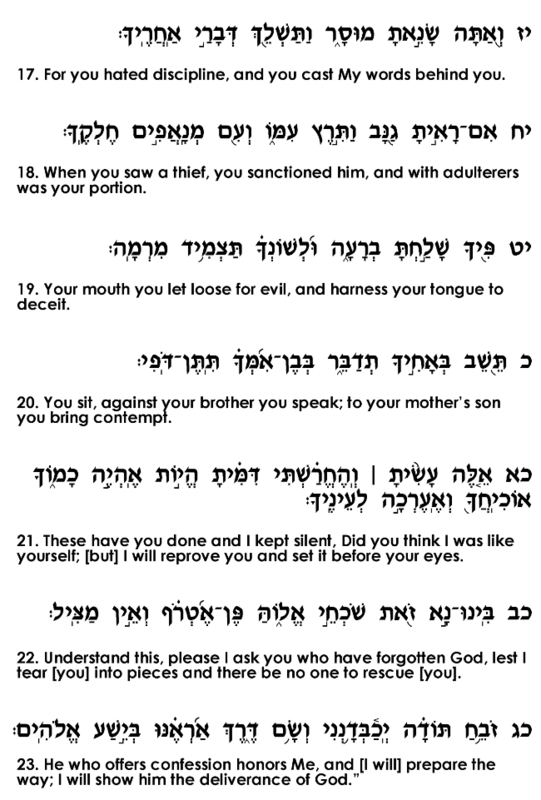 Continuing this theme of disingenuous piety, the final section of this chapter (verses 16-23) addresses those who study Torah without living according to its ideals. God here describes a person who "tells of My statutes" and "bears My covenant" upon his mouth, while conspiring with criminals and speaking deceitfully and insultingly about other people. Similar to the people who bring sacrifices without feelings of Teshuva, these people feel that they can earn God's favor through their Torah learning without implementing its teachings and values in their daily lives. 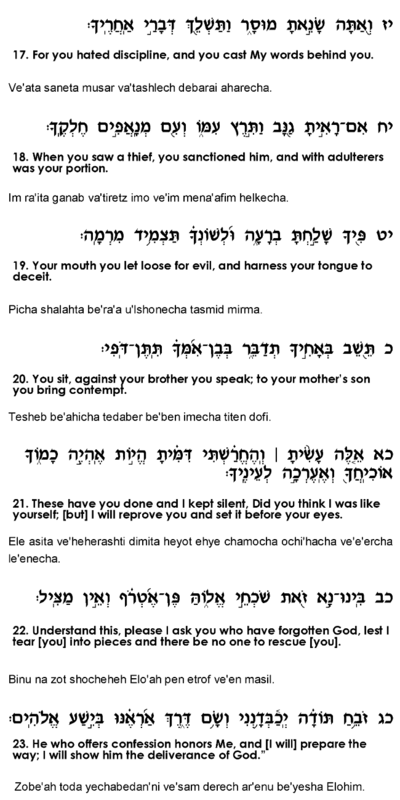 As mentioned, Asaf composed a number of songs to be sung as accompaniment to the sacrificial rituals in the Bet Ha'mikdash. This Psalm is indeed a most befitting theme for the context of the <?xml:namespace prefix = st1 ns = "urn:schemas-microsoft-com:office:smarttags" />Temple rituals, as it emphasizes the primacy of Teshuva within the process of sacrificial offerings. 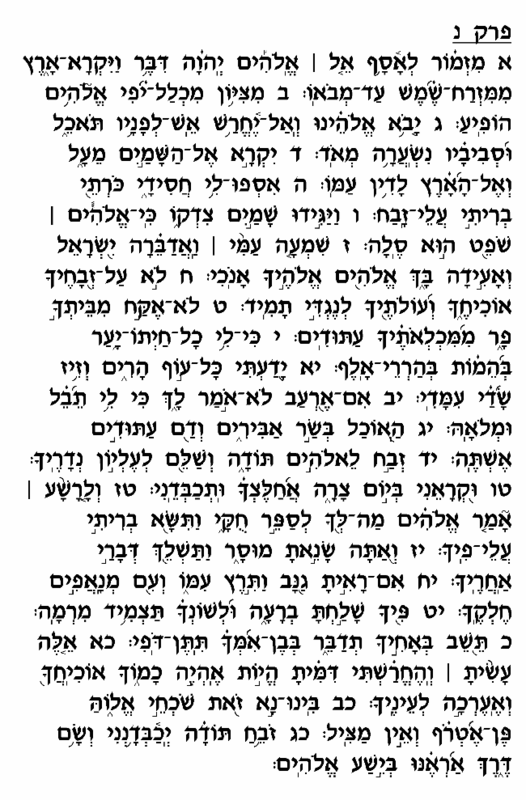 Those visiting the Mikdash seeking atonement would be well-advised to heed the call of this Psalm to focus not only on the ritualistic elements of the sacrifice, but also, and mainly, on perfecting their characters and resolving never to repeat the sins for which they seek expiation.